Artificial reefs have been used for decades in North Carolina waters to concentrate game fish by providing shelter for their prey, as shipwrecks and some natural formations do. Cities, counties, chambers of commerce, and sport-fishing clubs, most of them in Carteret County and the Cape Fear area, were responsible for such structures until 1973, when the North Carolina General Assembly allowed the Division of Marine Fisheries to use 0.125 percent of boaters' unrebated fuel taxes for building and inspecting reefs and conducting creel censuses. State and federal support has been inconsistent through the years, but local governments and private agencies continue to obtain permits for new reefs and to donate dock space, labor, equipment, and materials. 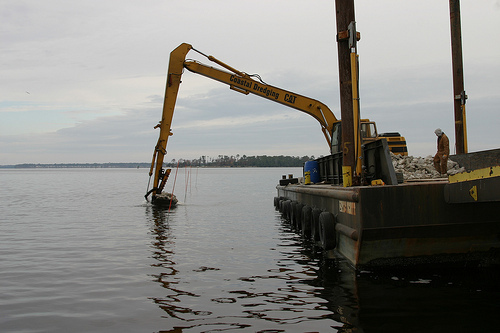 Consequently, North Carolina has developed one of the nation's most effective artificial reef programs without oil and gas rigs. By the early 2000s the Division of Marine Fisheries was overseeing several dozen oceanic and estuarine reefs, which provided good homes for fish and also resting places for decommissioned ships, worn-out railroad cars, rubble from demolished bridges, and hundreds of thousands of automobile tires that otherwise would take up valuable landfill space. Elizabeth B. Noble, The North Carolina Artificial Reef Master Plan (1988). "North Carolina Artificial Reefs Program." N.C. Division of Marine Fisheries. http://portal.ncdenr.org/web/mf/artificial-reefs-program (accessed August 31, 2012). Pridgen, Susan N. "Port provides storage for reef project." Stem to Stern: The Newsletter of the North Carolina State Ports Authority. August 2010. http://digital.ncdcr.gov/u?/p249901coll22,401363 (accessed August 31, 2012). Pridgen, Susan N. "Good things come to those who bait." Stem to Stern: The Newsletter of the North Carolina State Ports Authority. July/August 2008. p.8 http://digital.ncdcr.gov/u?/p249901coll22,397382 (accessed August 31, 2012). "Subway cars make Morehead City Port call." Stem to Stern: The Newsletter of the North Carolina State Ports Authority. July 2009. http://digital.ncdcr.gov/u?/p249901coll22,399211 (accessed August 31, 2012). Angely, Wilson. "Artificial Reef Site at James City, Craven County." Research Branch, N.C. Division of Archives and History. 1983. "Artificial Reef Fishing Program/Close Out." 1977. p. 1086. http://digital.ncdcr.gov/u?/p249901coll22,318093 (accessed August 31, 2012). NCDENR Division of Marine Fisheries. "New River Artifical Reef Project." Jacksonville, N.C., November 30, 2010. Image from Flickr user NCDOTcommunications. http://www.flickr.com/photos/ncdot/7752928418/ (accessed August 31, 2012).